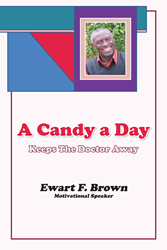 Recent release “A Candy a Day Keeps the Doctor Away” from Page Publishing author Ewart Brown is a layered opus that tackles realizations and reflections gained through life experiences. Ewart Brown, a Jamaican-born and now a US-citizen motivational speaker and director of Quiet Place Ministries, has completed his new book “A Candy a Day Keeps the Doctor Away”: a gripping narrative filled with encouraging, directional, and motivational perspectives for a deeper connection in life. Published by New York City-based Page Publishing, Ewart Brown’s absorbing tale recounts the author’s personal circumstances in the hopes of conveying virtues of love, acceptance, and appreciation for building positive relationships to make the world a better place to live in. Readers who wish to experience this edifying work can purchase“A Candy a Day Keeps the Doctor Away” at bookstores everywhere, or online at the Apple iTunes store, Amazon, Google Play, or Barnes and Noble.